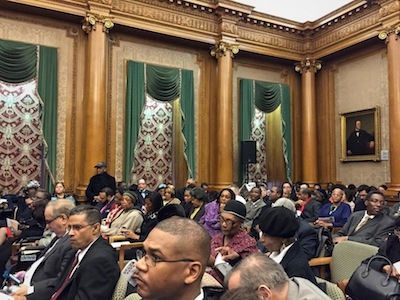 By Ali Cinar - Under leadership of Brooklyn Borough President Eric L. Adams for his First Interfaith Breakfast was held on Wednesday, December 3rd, 2014. There were over 300 Interfaith and Community Leaders at the program and The Rev. Dr. A.R. Bernard was the keynote speaker of the Program. 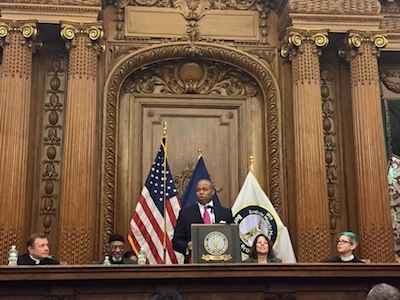 Brooklyn Borough President Eric L. Adams stated that " I am thankful today for you al coming here to my first Interfaith Breakfast Program. This show the strength of Brooklyn.This shows our Unity. Interfaith relations are important. We need to understand each other at the theological and social level to eliminate misconceptions and foster unity." Turkish Origin Fatih Mosque and Eyup Sultan Mosque &Cultural Center Leaders have also attended the meeting and met many Interfaith Leaders during the program. Ayhan Ozmekik who is the Turkish American Youth Association President said " This was a great initiative. We were able to meet many leaders around 5 Boroughs. We also discussed with some of the Ethnic Leaders to organize a joint event for next year. We are thankful for the Borough President organizing this outstanding event"
Borough President has also gave an special recognition to Rabbi Harry Berkowitz of the NYC Transit/MTA for his years of service. In addition, The Musical guest Neshama Carlebach and Josh Nelson has performed during the program with their outstanding songs.